The Huntsman: Winter's War is a 2016 American fantasy adventure film, both a prequel and sequel to Snow White and the Huntsman (2012), it takes place before and after the events of the first film. The film is the directorial debut of Cedric Nicolas-Troyan, who was a visual effects supervisor and second unit director on the first film. It is written by Craig Mazin and Evan Spiliotopoulos, based on characters created by Evan Daugherty, which like the first film were inspired by the fairy tale "Snow White" compiled by the Brothers Grimm, as well as "The Snow Queen" by Hans Christian Andersen. Reprising their roles from the first film, the cast includes Chris Hemsworth, Charlize Theron, Nick Frost, and Sam Claflin. The film also introduced new characters played by Emily Blunt, Jessica Chastain, and Rob Brydon. The film premiered in Hamburg on March 29, 2016, and was released in the United States on April 22, 2016. It received mixed to negative reviews from critics and audiences alike, with praise for the visuals and cast but many feeling the film was an unnecessary sequel and prequel. It grossed $165 million worldwide against an estimated $115 million production cost. Evil sorceress Queen Ravenna's powers allow her to know that her younger sister Freya, whose powers have not yet emerged, is not only involved in an illicit affair with an already elsewhere engaged nobleman Andrew, but is also pregnant with his child. Sometime after Freya gives birth to a baby girl, Freya discovers that Andrew not only reneged on his promise of elopement with her but also murdered their child. In a grief-fueled rage, her broken heart freezes over and she kills him with her sudden emergence of powers - the elemental control of ice. Freya abandons her sister's kingdom and builds herself a new kingdom up North. Ruling as the much feared Ice Queen, Freya orders parents to be killed and their children to be abducted so they can be trained to avoid the pain of love (as she suffered), and to be an army of fearsome huntsmen to conquer for her. Despite the training, two of her best huntsmen, Eric and Sara, grow up and fall in love. They secretly are alone together. Sara claims Eric in "marriage" by placing her metal medallion necklace that her mother had given her around his neck. Eric says he will never leave her side. They plan to escape to a free life together. Freya discovers their secret, confronts them, and creates a massive ice wall to separate them. Eric watches as Sara is killed by one of their fellow huntsmen. Eric is beaten by other huntsmen and thrown into a fast moving river. Seven years later, and after Ravenna's death, Queen Snow White falls ill after hearing Ravenna's Magic Mirror beckoning her. Because of its overwhelming dark magic, she ordered it to be taken to Sanctuary, the magical place that sheltered Snow White during the events leading to her retaliation and ultimately Ravenna's death, so the Mirror's magic can forever be contained. Snow White's husband, William, informs Eric that the soldiers tasked with carrying the Mirror went missing while en route to the Sanctuary. Eric realizes that he is being spied upon by Freya through sorcery via a magical ice owl which he destroys. Knowing the powerful dark magic of the Mirror can make Freya even stronger, perhaps invincible even, Eric agrees to investigate and attempt to retrieve the Mirror. Reluctantly though, he allows Snow White's dwarf ally Nion and his annoying half-brother Gryff to come along. They travel to the last known location of the soldiers. Eric discovers they attacked and killed each other because they used their own weapons on each other. He notices one arrowhead is different; it is made of gold with a large diamond. Eric pockets the arrowhead. At a tavern later, the trio are attacked by a group of Freya's huntsmen. They are thrown outside and are losing until they are rescued by a still alive Sara. Sara reveals that she was imprisoned by Freya the entire time, only to escape recently. Sara has not forgiven Eric for abandoning her. They decipher that Eric was falsely made to see Sara's death, while she was made to see him abandoning her rather than fighting to help. Eric convinces her that Freya conjured these visions to trick them apart, and eventually has Sara join with him and the dwarfs to thwart Freya. Soon, the quartet is ensnared in a trap set by she-dwarfs Bromwyn and Doreena. Eric bribes the she-dwarfs with the gold and diamond arrowhead to let them go. They convince the she-dwarfs to also help them find the Mirror. The two lead them through the land. They decide to stop because they don't know what lurks in the dark and resume traveling in the morning. Eric and Sara get intimate. Sara notices Eric is wearing the necklace she gave him. He says he never took it off. The next day the group travels to location across a bridge from the forest where the goblins that stole the mirror from Snow White's soldiers live. The party fights off the goblins and retrieves the Mirror. Eric sends the party with the Mirror ahead across the bridge. Once they are safely to the other side, he severs the cords of the bridge. He fights the goblins who came from the forest. They are beating him. Sara realizes Eric has sacrificed himself to save them. She improvises and fixes a bow. She has the dwarfs start a fire which she uses to light the tar on an arrow. Sara shoots the arrow at the goblins, many who go up in flames because instead of blood they are filled with tar. Sara weeps because she thinks Eric is dead. He climbs up to join them. He notices her tears. They kiss. As the group travels near the Sanctuary with the Mirror, they are ambushed by Freya and her huntsmen. Freya reveals Sara has been loyal to her all along, and that Sara was using her companions to find the Mirror for her. In the ensuing chaos, Nion and Doreena are turned into ice statues, and Sara shoots an arrow into Eric's chest on Freya's order. Eric falls to the ground and appears to have died. Freya departs with the Magic Mirror, but she is unaware that Sara purposely hit the metal medallion that she had given him so that the necklace would protect Eric from dying. Eric realizes that Sara loves him. Back in her palace, Freya recites the iconic verse associated with the Mirror, resurrecting Ravenna, who became one with the Mirror when Snow White vanquished her into it. Boasting a new suite of powers thanks to the Mirror's powerful magic, Ravenna usurps Freya's rule by coordinating Freya's huntsmen and army to reclaim the kingdoms Snow White had liberated. Eric infiltrates the ice palace with help of Gryff and Bromwyn. He attempts to assassinate Freya, but is stopped by Ravenna. When Freya realizes that Sara didn't actually kill Eric, betrayed, she reluctantly sentences them both to death because of Ravenna's manipulation. However, Eric is able to convince a few huntsmen to rebel, claiming the love of life-long brethren. Ravenna begins to kill the huntsmen. Freya, realizing that she regards the huntsmen as her own surrogate "children", protects them with an ice wall, separating the huntsmen from the sisters. As Eric, Sara, and the other huntsmen climb over the wall to fight Ravenna and retrieve the Mirror, the two sisters argue over the icy kingdom. Ravenna lets slip that she's responsible for withdrawing her sister's weakness, awakening her powers. Freya, now suspicious, forces Ravenna (who as the mirror's captive spirit must answer her summoner's questions truthfully) to reveal that the Mirror had told her that Freya's child would eventually be more beautiful than Ravenna. She had enchanted Andrew to kill the baby, ultimately causing the death of Freya's child so she could remain "the fairest of them all." Freya, outraged by her sister's evil deception and betrayal, finally turns against her. Freya is impaled by Ravenna, but with her remaining strength Freya freezes the Magic Mirror. Eric takes advantage and shatters the Mirror, thus destroying Ravenna. As Freya dies from her wounds, she smiles at the sight of a vision of her old loving self holding her baby and gladly witnesses Eric and Sara's devotion for each other. She says they are lucky. With Freya's death, those who had been imprisoned by Freya's magic are set free, including Nion and Doreena, while a mysterious golden bird flies overhead. Eric, Sara, and the huntsmen look forward to a new future while the dwarfs pair off romantically. Eric and Sara share a kiss, finally happy to have a free life together for the first time in their lives. Charlize Theron as Queen Ravenna, Snow White's evil stepmother who returns from the dead. Emily Blunt as Freya, Ravenna's sister. Jessica Chastain as Sara, a warrior who is Eric's wife. Nick Frost as Nion, a Dwarf who previously helped Eric and Snow White defeat Ravenna's army. Rob Brydon as Gryff, a debt-collecting Dwarf who is Nion's half-brother. Sheridan Smith as Mrs. Bromwyn, a feisty and greedy Dwarf who becomes allies with Nion and Gryff. Alexandra Roach as Doreena, a shy and gentle Dwarf and Nion's love interest. Sam Claflin as King William, Snow White's husband who helped her and Eric defeat Ravenna's army. Sope Dirisu as Tull, a fellow Huntsman. Sam Hazeldine as Liefr, a fellow Huntsman. Sophie Cookson as Pippa, a fellow Huntswoman. Fred Tatasciore as Mirror Man (voice), the physical form of the Magic Mirror. Colin Morgan as Andrew, the Duke of Blackwood and Freya's lover. Madeleine Worrall as Eric's Mother. A sequel to Snow White and the Huntsman was initially planned with director Rupert Sanders in talks to return. The sequel plans were changed in August 2012 to a spin-off film concentrating on the Huntsman instead. Universal announced a few days later that they were not shelving the sequel. Another report stated that Universal authorised a sequel with Stewart set to reprise her role, but without Sanders to return as the director. A script was written and production was set to begin at some point in 2013, with the film to be released in 2015. On June 4, 2014, Deadline reported that Frank Darabont, Gavin O'Connor and Andrés Muschietti were on the shortlist to direct a sequel. On June 26, 2014, Deadline confirmed that Darabont was in talks to direct the sequel. On July 31, 2014, it was announced that the film would be a prequel titled Huntsman and would not star Stewart as Snow White. Two years later, Stewart said that she voluntarily turned down an offer from the studio to provide a cameo in the film. On January 16, 2015, it was announced that Darabont had exited the film after he parted with Universal. Hemsworth and Theron were set to return for the film, while Emily Blunt was being circled for a new role. On January 20, 2015, it was confirmed that VFX specialist Cedric Nicolas-Troyan was set to direct the film, whose last draft was written by Darabont, following drafts by Craig Mazin and Evan Spiliotopoulos. The refectory at Waverley Abbey with fake vines and rubble added for use as a film set for The Huntsman: Winter's War. On February 24, 2015, Jessica Chastain was set to star in the film, Nick Frost was confirmed to reprise his previous role, while Blunt, who had been rumored to be interested, finally closed a deal to star as well. On March 18, 2015, it was revealed that Sheridan Smith, Rob Brydon, and Alexandra Roach were added to the cast to play dwarves alongside Frost's character Nion. TheWrap confirmed on May 7, 2015, that Sam Claflin would return as William in the sequel. Principal photography on the film began on April 6, 2015. Filming took place at Waverley Abbey in Surrey, England in April 2015. Filming also occurred from May to July 2015 in Windsor Great Park, England, at locations including South Forest, Johnson's Pond and in the Deer Park near Snow Hill. Filming was also done in Wells Bishop's Palace and Wells Cathedral. In July 2015, filming also took place at Puzzlewood, in the Forest of Dean. On October 8, 2015, it was officially announced, that James Newton Howard would return to score the film, after creating the music for Snow White and the Huntsman. The score album was released on April 22, 2016. Singer Halsey promoted the film by releasing an alternate version of her song "Castle", along with a subsequent music video, made for the film. On July 31, 2014, Universal Pictures announced the film's release date would be April 22, 2016. In February 2016, it was announced that the film would be released in 3D in international markets like Germany. In Poland, the theatrical release was scheduled for April 8, 2016, which was the date for many other international markets. On November 16, 2015, Universal Pictures unveiled four character posters for the film, along with the film's new title, The Huntsman: Winter's War. Three days later, on November 18, 2015, the first official trailer of the film was released, along with two additional teaser posters. A second trailer debuted on February 11, 2016. Universal released a final trailer on March 22, 2016. Hemsworth, Theron, and Chastain introduced a performance by Halsey of "Castle" at the 2016 MTV Movie Awards. The Huntsman: Winter's War was released on Digital HD on August 2, 2016, and was followed by a release on Blu-ray and DVD on August 23, 2016. The film debuted at No. 1 on the home video sales chart. A Blu-ray extended edition (with DVD & digital HD) was also released with a run time of 120 minutes. The Huntsman: Winter's War grossed $48.4 million in North America and $116.6 million in other territories for a worldwide total of $165 million, against a production budget of $115 million. In the United States and Canada, early tracking suggested the film would open to $24–30 million, which was significantly lower than its predecessor's $56.2 million opening in 2012. The film opened in 3,791 theaters and grossed $7.3 million on its first day, including $1 million from its early Thursday night previews. In its opening weekend, it grossed a lower-than-expected $19.4 million, which was about 64% less than the original film's opening. Due to its underperforming opening weekend, the film lost Universal $30–40 million, with some estimates having the total losses at up to $70 million. The Hollywood Reporter estimated the film lost the studio at least $75 million, when factoring together all expenses and revenues. However, Universal Studios definitely will recoup some, if not all of the loss through blu-ray/dvd sales, as well as through lucrative sales to cable networks and eventually television. Internationally, The Huntsman: Winter's War was released in a total of 65 countries. There were some estimates that the film will end its run at about $150 million internationally, which is lower than its predecessor's total of $240 million. One notable difference is that while Winter's War has secured a release date in China, Snow White and the Huntsman did not play there, and analysts believe that could make "some difference". It was released in 18 countries two weeks ahead of its U.S. debut, earning $19.1 million from 3,969 screens, and had No. 1 openings in eleven of them, and second overall at the international box office charts, behind the superhero film Batman v Superman: Dawn of Justice. In its second weekend, it added 7 new markets and grossed a total of $17.8 million, falling only by 8% from its previews weekend, and still remained at No. 2, behind The Jungle Book. It was still No. 2 in its third weekend. Its top openings occurred in China ($10.4 million), the United Kingdom and Ireland ($4.2 million), Brazil ($3.1 million), Mexico ($2.8 million), France ($2.6 million), Korea ($2.1 million), Russia ($2 million), the Philippines ($1.6 million), Malaysia ($1.6 million), Spain ($1.4 million), and Thailand ($1.2 million). In China, it was in third place, behind local pic Yesterday Once More and the continued run of The Jungle Book. It lost a tremendous number of screens in its second weekend due to the arrival of three new local pics – Book of Love, Phantom of the Theater and MBA Partners – along with the continued run of The Jungle Book and as a result it grossed just $710,000. In terms of total earnings, its largest markets outside of North America are China ($15.6 million), the UK ($7.3 million) and Mexico ($7.2 million). On Rotten Tomatoes the film has a rating of 20%,based on 199 reviews, with an average rating of 4.2/10. The site's consensus reads, "The Huntsman: Winter's War is visually arresting and boasts a stellar cast, but neither are enough to recommend this entirely unnecessary sequel." On Metacritic, the film has a score of 35 out of 100, based on 41 critics, indicating "generally unfavourable reviews". Audiences polled by CinemaScore gave the film an average grade of "B+" on an A+ to F scale. ^ "THE HUNTSMAN: WINTER'S WAR [2D] (12A)". British Board of Film Classification. March 23, 2016. Retrieved March 23, 2016. ^ FilmL.A. (May 23, 2017). "2016 Feature Film Study" (PDF). FilmL.A. Feature Film Study: Page 25. Retrieved May 10, 2018. ^ a b "The Huntsman: Winter's War (2016)". Box Office Mojo. Retrieved January 9, 2017. ^ Coggan, Devan (2015-01-17). "See Charlize Theron, Jessica Chastain in new The Huntsman: Winter's War character posters". EW.com. Retrieved 2015-11-16. ^ Fleming Jr, Mike (June 7, 2012). "Universal Gets Rolling On 'Snow White And The Huntsman' Sequel". Deadline.com. Retrieved August 28, 2018. ^ Kim Masters (August 14, 2012). "Kristen Stewart Dropped from 'Snow White' Sequel Plans (Exclusive)". The Hollywood Reporter. Archived from the original on December 19, 2013. Retrieved August 15, 2012. ^ Ann Lee (August 14, 2012). "Kristen Stewart hasn't been dropped from Snow White sequel, says studio". Metro. Archived from the original on October 25, 2012. Retrieved August 16, 2012. ^ a b Sieczkowski, Cavan (December 21, 2012). "Kristen Stewart Confirmed For 'Snow White And The Huntsman' Sequel: 'I'm So Excited'". The Huffington Post. Archived from the original on December 24, 2012. Retrieved December 26, 2012. ^ Sen, Abhijeet (November 20, 2012). "Kristen Stewart to star in 'Snow White' sequel sans cheating director". RealBollywood.com. Archived from the original on November 22, 2012. Retrieved April 20, 2013. ^ Chitwood, Adam (April 16, 2013). "Universal Aiming for 2015 Release for Snow White and the Huntsman 2; "Actively Working" on Next Bourne". collider.com. Archived from the original on April 19, 2013. Retrieved April 20, 2013. ^ Fleming, Jr, Mike (June 4, 2014). "'Huntsman 2′ Helmer Short List: Frank Darabont, Gavin O'Connor, Andy Muschietti". Deadline Hollywood. Archived from the original on August 5, 2014. Retrieved June 4, 2014. ^ Fleming, Jr, Mike (June 26, 2014). "Frank Darabont In Talks To Direct 'Snow White And The Huntsman 2′". Deadline Hollywood. Archived from the original on July 7, 2014. Retrieved June 26, 2014. ^ a b "Universal's Snow White Prequel 'Huntsman' Targets April 2016 Release". Deadline Hollywood. July 31, 2014. Archived from the original on August 5, 2014. Retrieved August 1, 2014. ^ Dickson, Evan (July 31, 2014). "The Huntsman Prequel Set For April 2016, The Mummy Moves to June". Collider.com. Retrieved March 2, 2017. ^ Reyes, Mike (June 2016). "Why Kristen Stewart Was Happy To Not Be Part Of The Huntsman: Winter's War". CinemaBlend. Retrieved March 2, 2017. ^ a b Fleming Jr, Mike (January 16, 2015). "Frank Darabont Exits 'The Huntsman'; Emily Blunt Still Circling". Deadline Hollywood. Retrieved January 17, 2015. ^ Kroll, Justin (January 20, 2015). "Cedric Nicolas-Troyan to Replace Frank Darabont as 'Huntsman' Director". variety.com. Retrieved January 21, 2015. ^ Jaafar, Ali (February 24, 2015). "Jessica Chastain Joins 'The Huntsman' For Universal". Deadline Hollywood. Retrieved February 26, 2015. ^ Ford, Rebecca (March 18, 2015). "Universal's 'The Huntsman' Finds Its Dwarves (Exclusive)". hollywoodreporter.com. Retrieved March 22, 2015. ^ Panosian, Diane (April 6, 2015). "On the Set for 4/6/15: 'Captain America: Civil War' & 'The Huntsman' Start Shooting, Ryan Coogler Wraps 'Rocky' Sequel 'Creed'". ssninsider.com. Archived from the original on April 8, 2015. Retrieved April 6, 2015. ^ "Surrey Film Locations". SurreyLife. 22 April 2015. Retrieved 28 June 2015. ^ a b "The Huntsman filming starts as Chris Hemsworth, Emily Blunt don Medieval costumes on set; Extras needed for filming". vcpost.com. July 6, 2015. Retrieved July 7, 2015. ^ "Hollywood film set in Wells includes fake castle". Wells Journal. July 8, 2015. Archived from the original on November 25, 2015. Retrieved December 2, 2015. ^ "Show business: Hollywood visits Gloucestershire to film Huntsman movie at Puzzlewood". South West Business. Retrieved 21 July 2015. ^ "Łowca i Królowa Lodu" (in Polish). Filmweb. Retrieved 21 April 2016. ^ Coggan, Devon (November 16, 2015). "See Charlize Theron, Jessica Chastain in new The Huntsman: Winter's War character posters". Entertainment Weekly. Retrieved November 16, 2015. ^ Coggan, Devon (November 18, 2015). "Charlize Theron and Emily Blunt amass an army of darkness in The Huntsman: Winter's War trailer". Entertainment Weekly. Retrieved November 18, 2015. ^ Comingsoon.net Staff (February 11, 2016). "The New Huntsman: Winter's War Trailer is Here!". Comingsoon.net. Retrieved February 11, 2016. ^ Scott Mendelson (March 22, 2016). "'Huntsman: Winter's War,' With Emily Blunt, Charlize Theron, Jessica Chastain, Gets Final Trailer". Forbes. Retrieved March 22, 2016. ^ "August 23: This Week on Blu-ray, DVD and Digital HD". Comingsoon.net. Retrieved 19 June 2017. ^ Anita Busch (April 19, 2016). "'The Jungle Book' Expected To Snow Under 'The Huntsman: Winter's War'". Deadline Hollywood. Retrieved April 20, 2016. ^ Brent Lang (April 20, 2016). "Box Office: 'The Huntsman: Winter's War' No Match for 'The Jungle Book'". Variety. Retrieved April 21, 2016. ^ Brad Brevet (April 21, 2016). "'Jungle Book' To Repeat at #1 Over 'The Huntsman: Winter's War'". Box Office Mojo. Retrieved April 22, 2016. ^ Scott Mendelson (April 23, 2016). "Box Office: 'Huntsman: Winter's War' Gets Iced With Chilly $7.3M Friday". Forbes. Retrieved April 23, 2016. ^ a b "'Jungle Book' Remains King Of The B.O. With $52M-$57M; 'Huntsman' Seeking $21M-$23M". Deadline Hollywood. ^ Anthony D'Alessandro (April 23, 2016). "'Jungle Book' Still A Box Office Bestseller With $60.8M, 'Huntsman' Trips With $20.1M – Saturday AM Update". Deadline Hollywood. Retrieved April 24, 2016. ^ Scott Mendelson (April 24, 2016). "Weekend Box Office: 'The Huntsman' Opens 64% Lower Than 'Snow White And The Huntsman'". Forbes. Retrieved April 24, 2016. ^ Brent Lang (April 26, 2016). 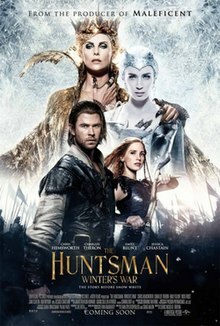 "'Huntsman' Faces Steep Writedown After Chilly Box Office Results". Variety. Retrieved April 27, 2016. ^ Pamela McClintock; Mia Galuppo (September 8, 2016). "'Ben Hur' to 'BFG': Hollywood's Biggest Box-Office Bombs of 2016". The Hollywood Reporter. Prometheus Global Media, LLC. Retrieved July 13, 2018. ^ Nancy Tartaglione (April 9, 2016). "'The Huntsman: Winter's War' Waging $21.3M Weekend In Offshore Bow – Intl Box Office". Deadline Hollywood. Retrieved April 10, 2016. ^ a b c Nancy Tartaglione (April 17, 2016). "'The Jungle Book' Jumps To $138.6M; Passing $300M WW Today, 'Batman v Superman' At $829M WW – Intl B.O. Final". Deadline Hollywood. Retrieved April 18, 2016. ^ a b Nancy Tartaglione (April 11, 2016). "'Batman V Superman' At $487.7M Offshore; 'Jungle Book' Swings With $31.7M; 'Huntsman' Misses Mark; 'Zootopia' Sets Dis China Record – Intl B.O. Final". Deadline Hollywood. Retrieved April 12, 2016. ^ a b c Nancy Tartaglione (April 24, 2016). "'Jungle Book' A $337M Offshore Beast As 'Huntsman' Musters $80M; 'Zootopia' Tops $900M Global – Intl B.O. Update". Deadline Hollywood. Retrieved April 25, 2016. ^ a b Nancy Tartaglione (May 1, 2016). "'Captain America: Civil War' Blasts Off With $200.2M In First Overseas Frame; 'Jungle Book' Still A Beast – Intl Box Office Update". Deadline Hollywood. Retrieved May 1, 2016. ^ Patrick Frater (May 1, 2016). "China Box Office: 'Book of Love' Wins May Day Weekend". Variety. Retrieved May 2, 2016. ^ "The Huntsman: Winter's War (2016)". Rotten Tomatoes. Retrieved May 19, 2017. ^ "The Huntsman: Winter's War reviews". Metacritic. Retrieved April 22, 2016. ^ "The 17th Annual Golden Trailer Award Nominees". GoldenTrailer.com. Retrieved October 27, 2016.